Dove Dry Oil, Pure Care Nourishing Hair Treatment with African Macadamia Oil 3.38 fl oz/100 ml. - Luxury Beauty Care Products ! 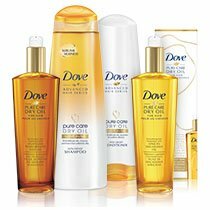 Dove Pure Care Dry Oil Nourishing Treatment with African Macadamia Oil is a lightweight, luxurious formula, infused with pure drops of natural oils that leave your hair nourished and revitalized with silkiness, softness and shine. With our unique Dry Oil technology that absorbs rapidly, hair is sublimely silky, isn't greasy or weighed down, is manageable and is actually protected from the damaging stress caused by blow-drying and styling. For best results, use with the full line of Dove Pure Care Dry Oil products. How to use: Spread 3 to 4 pumps of oil between hands and apply to clean, damp hair, from mid-length to tips. *when using shampoo, conditioner and treatment as a system vs. non-conditioning shampoo. This entry was posted in Hair Care on February 22, 2016 by admin.